Till 26th March, we’ll be occupying the walls of The Birds Nest with some awesome artwork from Dimitri Antorka-Pieri, Sabba Khan, Harriet Jones, Vicky Samuel, Amneet Johal, Spelling Mistakes Cost Lives, Keara Stewart, Elizabeth Querstret, and many other extremely talented small pressers. A HUGE THANK YOU to those who joined us at our AP Social on the opening night – including our favourite band in the whole wide world the AWESOME Giant Burger! And to those who joined us the day after for our Mini Zine Fair – was lovely to see you all! We had an amazing two days – full of all the good things – great company, zine-reading, and impromptu gigs! 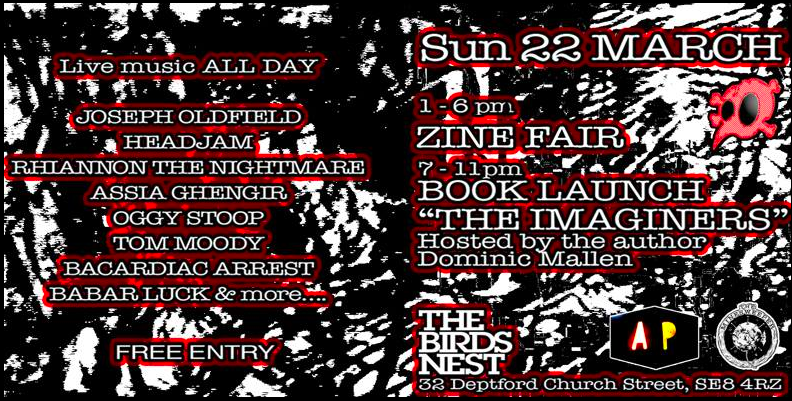 Our lovely friends Minesweeper Collective are holding a Zine Fair on 22nd March and are seeking exhibitors! 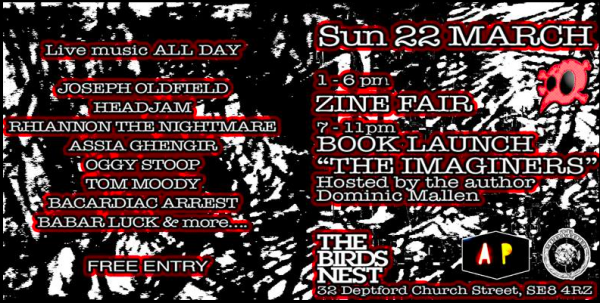 Independent artists with zines, comics, and handmade books would be welcome to fill the 10 tables available. Tables are free from charge and to book please email internsweep@gmail.com asap! The fair will be accompanied by live acoustic music throughout the day and promises to be awesome. Further info here.